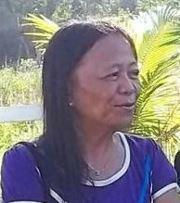 Garcia, a retired teacher and environmentalist, is the President of the Gonzaga Alliance for Environmental Protection and Preservation which is opposed to magnetite mining operations in Gonzaga town in Cagayan Province. The Cagayan provincial government authorized mining by Chinese and Taiwanese corporations in the area. Gonzaga Mayor Carlito Pentecostes Jr. charged Garcia with libel for a Facebook note posted on April 2011. The note condemned Pentecostes for harassing community leaders planning an anti-mining demonstration.